Chelsea manager Jose Mourinho has spoken out against the fixture line-up, as his side has had to return from a long midweek trip to Istanbul to tackle Fulham in Saturday’s Premier League game. Mourinho is clearly unhappy his side are back in action so soon and says his players have not trained since their 1-1 Champions League draw with Galatasaray in Turkey on Wednesday. The Premier League leaders are away to neighbours Fulham in Saturday’s afternoon kick-off. 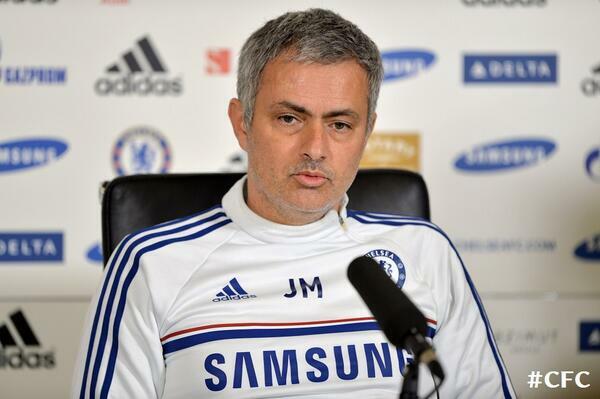 Jose Mourinho Hits Out at the Premier League Over Fixture List. The Portuguese boss said: “We arrived [back from Istanbul] at 6am in the morning. Yesterday we didn’t train and we didn’t train today. “We don’t play Sunday which would be difficult, we play Saturday which makes it even more difficult. “It makes the players’ job difficult, I don’t play so it’s not a problem for me or the people that make the fixtures. We all prefer to play game after game, but we want to do it with conditions to recover and equal conditions for everyone. Deulofeu Faces Five Weeks on the Sideline, Baines Could Be Back on Boxing Day. King James Turned Up the Heat on Spurs as Miami Retains NBA Title. CHAN 2014: Madu, Isa, Three Others, Exit Eagles Camp. English Premier League Table Update: Arsenal Is Back On TOP!